"Having a desire to create things of lasting beauty and that bring glory to the creator of all things, I have produced these bronzes. I hope they bring you pleasure and joy. My work blends a love of nature and a love for people and cultures around the world. I also love to make work that appeals to the utility of craft yet is fine in its form." James G. (Jim) Moore was born in Fort Collins, Colorado. Jim was fortunate to have parents who worked hard to expose their children to the wonders of the world through regular trips to the mountains, libraries, museums, church and other places of faith and learning. Art was, since childhood, a passion for Jim. Having served in Naval Reserves and having completed a tour of duty in Iraq, Jim had the benefit of ship board travel in the South Pacific. Here was an opportunity to see parts of Thailand, Hong Kong, the Philippines and Japan where arts and crafts have a strong and interwoven heritage. Huge temple bells and beautiful, serene Zen gardens in Japan made lasting impressions on what was to become his passion. Formal education began at the University of New Mexico and was completed at the University of Colorado, completing his BA in 1993 and a Masters in Education in 2004. 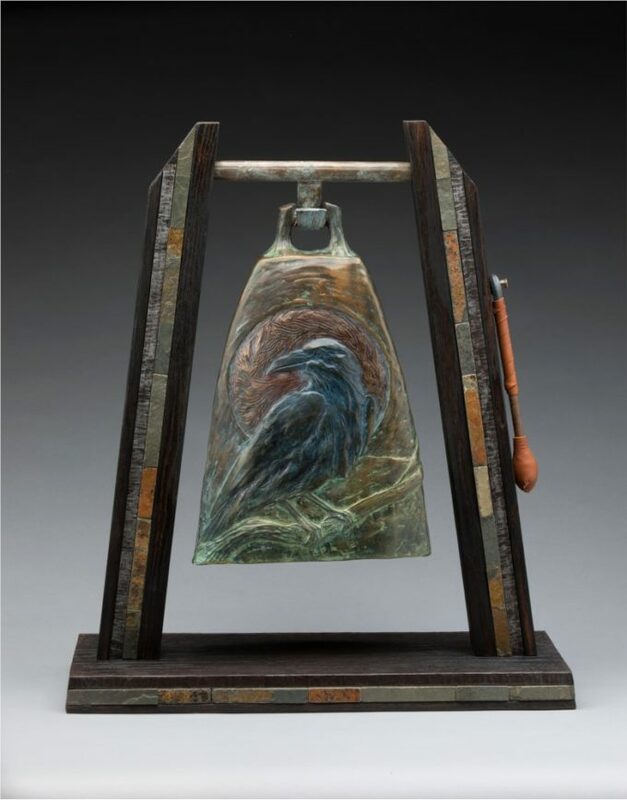 As an artist and art educator, James has been working professionally in bronze for the last 16 years. Good fortune placed him in Colorado during the boom in sculpting and the sculpture industry in the Loveland, Colorado area. 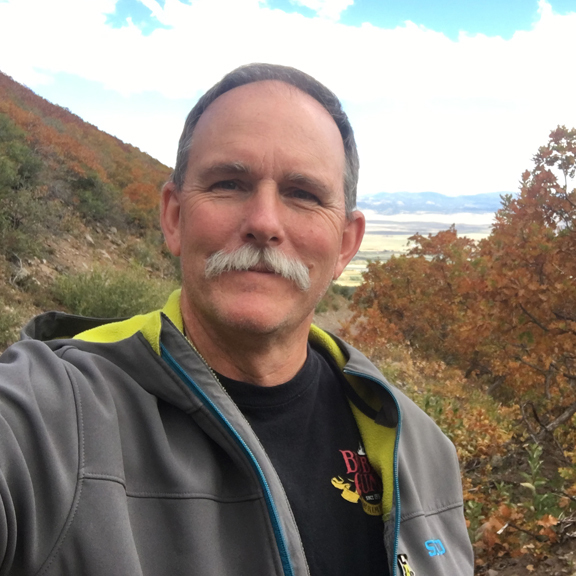 Success of the sculptured bells has taken him from full time instructor to a part-time high school art instructor for a charter school in Greeley Colorado. As of early 2009 Jim will concentrate on his sculpting career and retire completely from teaching. There is much re-occurring imagery in the work of Jim Moore. 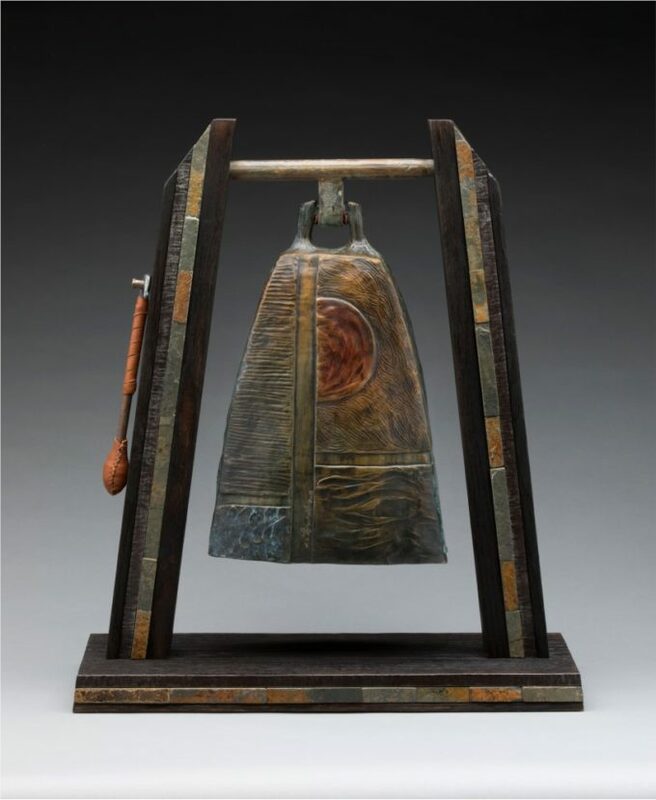 Released in late 2008, the “Elements” bell is a good example of the further extension of Jim’s total abstraction as first seen in the popular piece titled “Four Seasons”. Both pieces have panels representing four elements of wind, earth, fire and water. 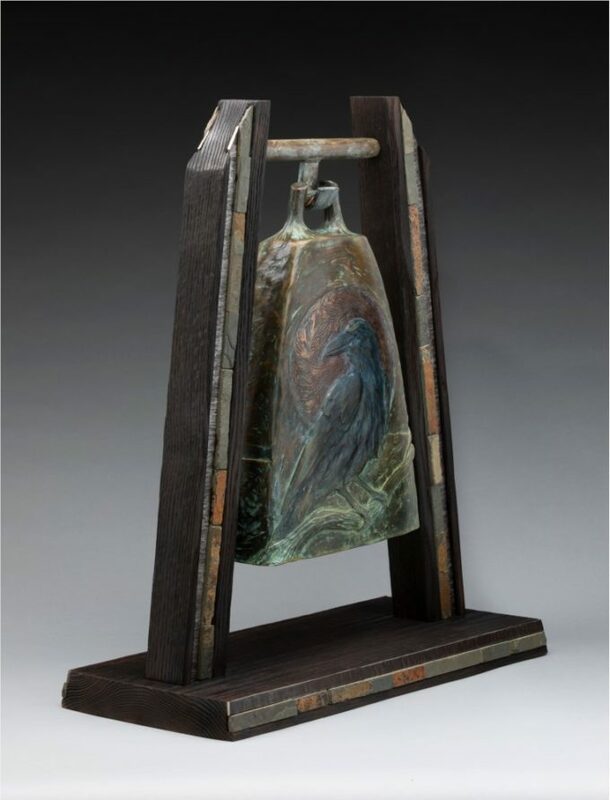 In “Elements”, the cap of the bell represents the plant and animal elements with representations of twigs and a box turtle shell. The steel stand that suspends the bell carries through the abstract theme. His award winning work is in private and public collections across the United States and Europe. James lives with his family in a small rural community on the eastern plains of Colorado. He, his wife and two daughters enjoy a small acreage where they raise bees, a garden, horses, dogs and an assortment of other animals. This environment and the Colorado outdoors provide plenty of inspiration.